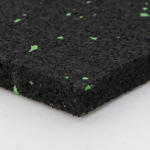 Acoustilay Tilemat is specifically designed for installation under ceramic and stone floor tiles. It is easy to install and manufactured using recycled materials. Acoustilay Tilemat can be used in new build projects, refurbishments and conversions. Made from recycled rubber and EDPM, Acoustilay Tilemat has been developed to maintain excellent acoustic properties throughout the life of the product to give long-lasting impact sound insulation.